This is a place where friends of The Goathouse Refuge can remember the ones they have lost. It is dedicated to the life and spirit of Serena. If you would like to add your own memorial, please send your words and a picture here. Our dear Sophie was the first kitty we ever rescued. He had been abandoned by some neighbors and was injured, so we took him to the vet and he became ours. Our cat Simone was not thrilled but Sophie acted as if he was right at home and Simone grew to accept his new companion. 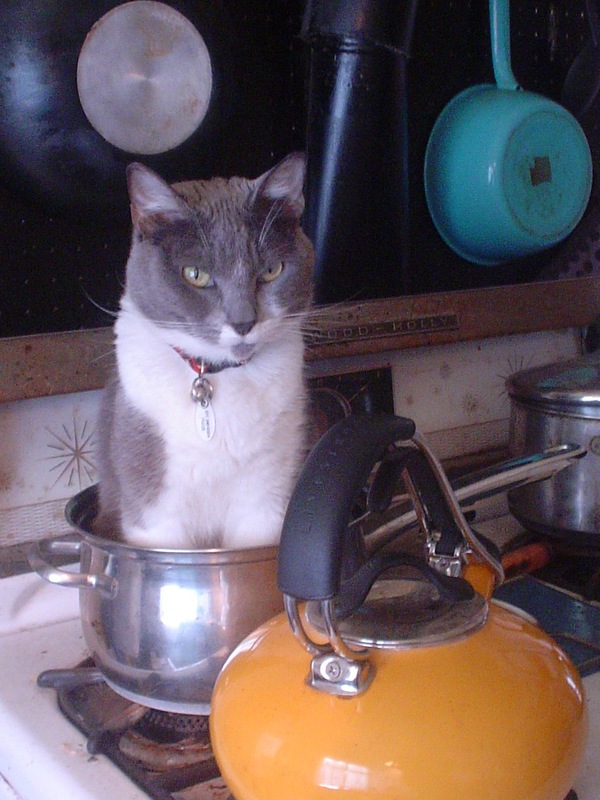 Sophie always knew how to assert himself and adjusted to quite a few changes in 14 years, including moving several times, becoming an indoor kitty, and new additions to our family. He knew he was meant to be with us. He was a jealous guy, but not unhappy; he just felt he was entitled to the best spots and the most attention. He loved laps and licking plates, and treats (he would give me the paw for more) and he was always brave at the vet. 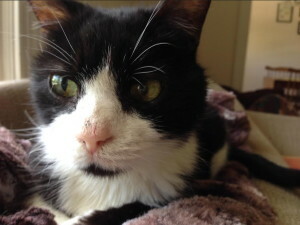 He was our spirited tuxedo man with the pink nose and the black goatee. We love you so much, sweet Sophie-cat. Garfield found us when he was barely the size of my hand. He was stuck in the motor. We found the owner and as Garfield ran up my husband’s arm, and into our hearts. He was the first addition to our new home, even before furniture! 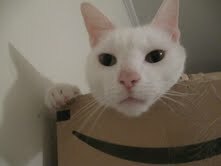 He became the King of the house and the Alpha Cat. He loved catching paper balls from 5′ in the air. He loved catnip, patrolling the house. He looked forward to the chicken we would bring home each week! An would go nuts over Friskies treats, he would even scoop his snacks out of the bag by himself! He also loved looking in the fridge for his own snack. He knew when I was heading home and would go sit in the window as I turned the corner. He grew up to be 22lbs, and ruled his kingdom for twelve years until cancer took him from us. I couldn’t be there because of my job on October 31st,2013 for his exploratory surgery,I was going as fast as I could, only 6 hours away. I should have waited until I was home to do the surgery, but all of us didn’t think there was anything wrong. The cancer was everywhere, he was so brave, never showed any pain. I knew I had to let him go without holding him for the last time. I thank Dr.Patrick for holding him for me. 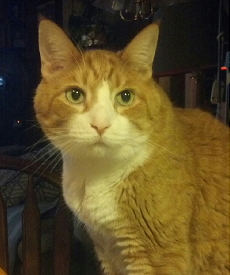 I send this donation in memory of My Loving Garfield! In memory of Lottie, the sweetest of souls. 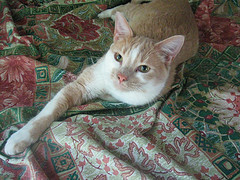 Orion was a sweet, loving and handsome orange and white little boy. We will miss him very much, but are comforted knowing that he was loved immensely during his short time with us. 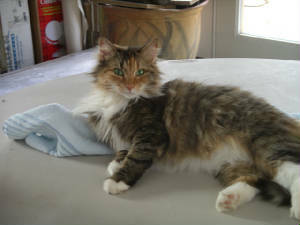 Margaret went to the Rainbow Bridge peacefully on Sept 14, 2012. We will miss this beautiful and friendly cat! Rest in peace, August 2011. After seventeen plus years as a constant and intensely affectionate companion, my precious cat PawPaw passed away. 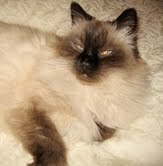 As you know, he was known for his love of cuddling and making friends with whomever would indulge him. He is the last survivor of three animal companions who grew up in this house together — Barkley and Annie having preceded him in departure. To say I loved him and will miss him barely touches the truth. But as my dear friend Paul said, “we’ll see him again.” I am deeply grateful to those of you who helped me look after him in his final days. 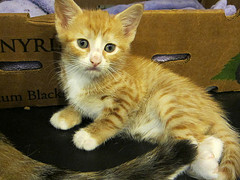 Lily was a kitten when found, swooped up from a busy road only seconds before certain death. She spent her life giving thanks by filling our lives with warmth and affection. The only cat we have ever known that would walk with us down a trail as if she were a dog, and yet still stay so very much a cat. We will miss her in the morning, when she would greet us before anyone else. 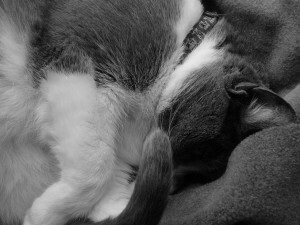 We will miss her at night, when she would fall asleep as close to our faces as she could get. And we will miss those beautiful blue eyes, and the endless love behind them. I got Simone when he was only six weeks old, and he was the tiniest kitten I had ever seen. He was supposed to be a girl, but he wasn’t, and he was supposed to be my boyfriend’s cat, but he became mine. 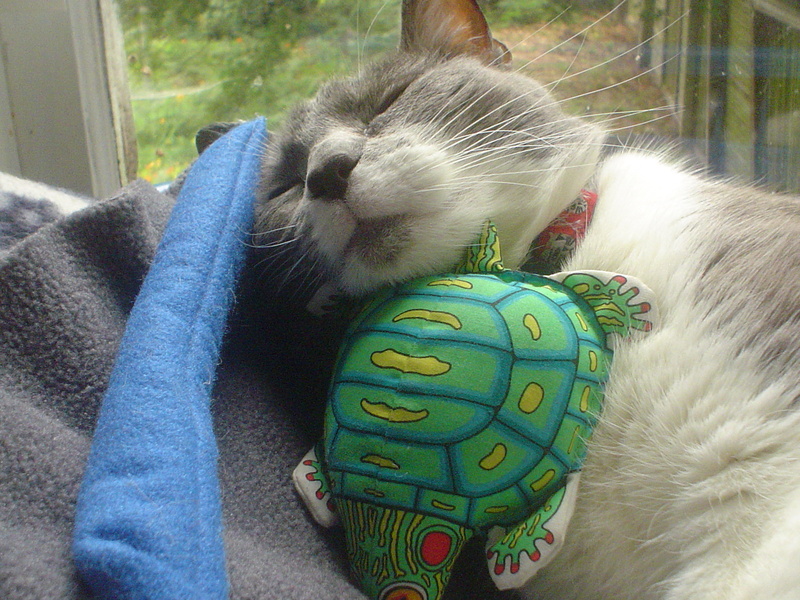 It was just me and him living together for several years, and even after our home grew to include my husband and five more cats, Simone was mine and I was his. He was demanding, jealous, smart, very diabolical and stubborn, handsome, crotchety, and absolutely committed to being fed well and often. We were together for sixteen years, and he died in November. The pain of losing Simone was the worst experience of my life, but I am so glad that he was my cat, and that I was able to love, fight with, and care for him. I am the better for him having been in my life. “Peanut”, my affectionate nickname for “Little Buddy”, was the female who first taught me the meaning of unconditional love and personal commitment towards another living being. She was abandoned, feral; a runt of the litter orange tabbie kitten; small enough to fit in the palm of your hand, lithe as a gymnast, and as quick on her feet as ‘a bolt of greased lightnin’! Then, her home was beneath the rusted hood of a junked car in a scrap yard adjacent to the alley behind the Cat’s Cradle Club, a favorite rock music venue which I haunted each and every night from 10pm until the sun came up, throughout a freezing month of December in 1994. A born ‘practical joker’, Peanut’s favorite pasttime was to walk out in full view of everyone, and flop over on her right side in the middle of the alley, nonchalantly licking her paws, and then rolling over on her back, as if begging to be petted and adored. Then, just at the moment when anyone’s hands might touch her, she … in one continuous motion, quicker than the human eye can comprehend, would spring suddenly on to all fours, streak out of sight, and make herself inaccessible, by running underneath the cars parked in the lot which served the club and its adjacent businesses. Sometimes I saw college kids toss empty coke or beer cans at the funny little cat with stripes on her tail like an orange racoon. 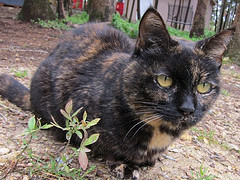 Until I began bringing with me a tin of sardines each night for a week to feed her, eventually enticing her into jumping into a large plastic bin to eat in privacy; at which time I closed the lid, drove home with her hissing, spitting, and sputtering at me; a display of classic feline fury. Then, one week later, having packed away all destructible personal items, and taken down all the curtains, hanging towels, and and bookcases, I asked her “Are you my ‘Little Buddy’?”… at which time she did a little ‘jig’ on one back paw, spun like a top, and jumped up onto the top of my stereo loudspeaker, from where she elicited the most heart rending “squeeeeeek” acknowledging not only that “Little Buddy” was indeed her name, but also declaring me to be her new found companion keeper, my dwelling place now hers as well, and promising to love, honor, cherish, and obey me (that is … at least most of the time!). 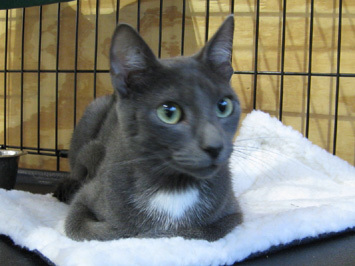 This contract being mutually binding, “Little Buddy”, my new friend, caregiver, and companion, leapt down from the top of the loudspeaker cabinet, ran over to me where I lay on the floor, laid her head down in the crook of my elbow, and fell fast asleep, purring loudly. … and I gave love. John died suddenly on June 25, 2009. He was an extraordinary creature. Extremely intelligent, curious, confident, and affectionate. He was loved by everyone who met him, and he loved everyone in return. He will be profoundly missed. 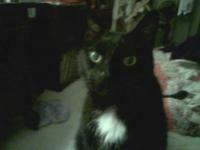 My Boris went to God today (July 23, 2009) and he was my baby, but God needed him more than I did. I was 5 when i got him and none or nothing can or will replace him! He was my lover boy and did not want to let him go. Nicole Lawson, 11 years old. 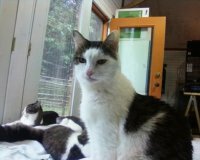 Marty, twin brother of Sweety, went into heart failure in July 2009 and spent the last months of his life receiving special attention and love from everyone at the refuge. 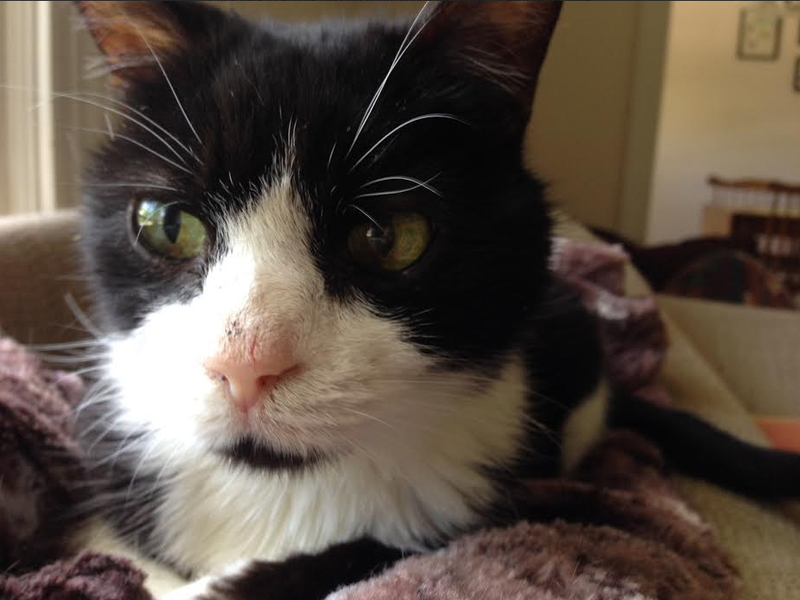 He was one of 18 cats brought down from New York, and of those 18 he was one of the most kind and loving. Marty is missed by all.